Young riders on the set of Billy and Blaze; at far left is Kat Fuqua and her pony Ladybug, and “Billy” — Henry Lesko– is pictured second right with Banbury Cross Abu. The work of a much-loved author of horse and pony books from the 1930s to the 70s is being brought to life in a new movie. The film is being shot by Welkin Studios in some of the same pastoral settings CW Anderson admired while in Virginia. Even though the prolific author wrote many other books on subjects from architecture to Greek sculpture, only the famous Billy and Blaze series weathered the changing moods of society and is still in print today. 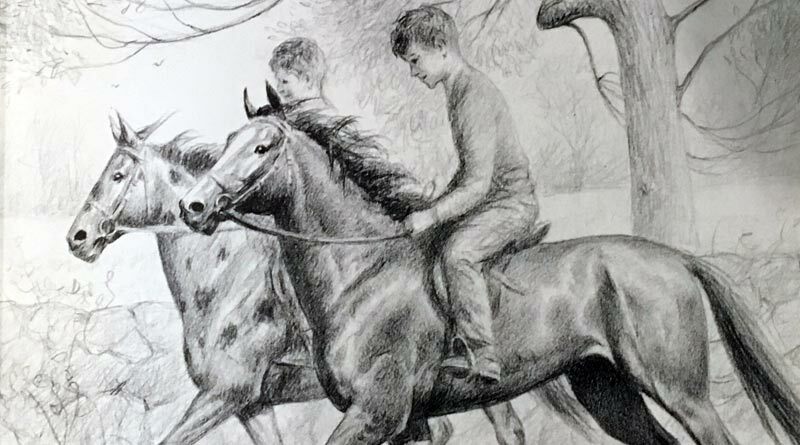 Billy and Blaze, and Tommy and Dusty, from the cover of Blaze finds Forgotten Roads, by CW Anderson. Blaze will be played by the pony Banbury Cross Abu. Taking the part of Billy is young rider Henry Lesko, while two-time US eventing gold medal winner Tad Coffin plays Billy’s grandfather. The film also features young pony hunter rider Kat Fuqua, whose pony Finesse RF — Ladybug — plays Pickles. Ladybug is the top ranked USEF Medium Hunter Pony, and Fuqua was recently awarded overall Grand Champion Pony Hunter at the 2018 USEF Pony Finals. The pair play Billy’s competition during one of the movie’s jumping scenes, where Fuqua and Ladybug are bested by Billy and Blaze during the final round of competition. Clarence William Anderson (1891-1971) was born in Wahoo, Nebraska. He was known as Andy to his family and friends. When he wasn’t out riding horses, he was drawing them, taking great interest in their bone structure and conformation. Anderson started his career by illustrating for other authors, but eventually began developing texts to accompany his realistic and lively black and white drawings. He is best known for the Billy and Blaze series. Billy and Blaze, and Tommy and Dusty, from Blaze finds Forgotten Roads, by CW Anderson. The adventures of Billy and Blaze revolve around proper care of the horse, while teaching a lesson. Anderson would go to great lengths to give accurate information. He would even go on to write Heads Up, Heels Down as a training tool for young horse lovers. All of the stories Anderson wrote would be based on true stories or people that he knew-only the plots were fictitious. An accomplished equestrian and respected judge of hunters and jumpers through the American Show Association, he was widely revered for his love all things horses. His deep knowledge of horsemanship provided the opportunity to build his reputation in horse lovers’ bookcases around the world. Anderson studied at the Art Institute of Chicago and then moved to New York City to take up the business of being a freelance artist/illustrator. The Billy and Blaze series represents only nine of more than 40 books he wrote and illustrated about horses. The film is to be released next year after post production.